As the Android platform celebrated its 2nd birthday last month, I thought now would be a good time to take a step back and look at all the music players available on the Market right now. Only a year ago, there were just a couple of worthy contenders, but now we have a choice of more than a dozen very good and popular apps and a few hundred not so popular ones. It's easy to get lost, isn't it? What I'm looking for is not just a vote for the best app but also your reasoning for why it deserves to be #1. What does it do that others don't? Why do you think its implementation is the best of the bunch? I encourage you to not leave this page without explaining if you cast a vote. I'll go first. For a long time, my favorite player has been TuneWiki due to its ability to play Shoutcast streams (meaning online radio). However, lately, it has been stuttering and dying a lot on my EVO, so I abandoned the idea and switched to playing local music with Winamp. I was extremely excited about Winamp when it was released, but it got quickly trumped by a new and completely unexpected player ("player" pun intended) called PowerAMP (post #2) by an unknown Russian developer Max MP. PowerAMP still tops my personal chart to this day. Why do I love PowerAMP so much? It has a gorgeous interface, an equalizer (it really does make a difference), and flawless headset button control, including something I've never seen implemented before - the ability to skip to the next song upon a long press of the headset button. To me, personally, that last feature is worth the most, as I can now move on to the next song while biking by just tapping my cord (FYI: these are the earphones I use: Ultimate Ears TripleFi 10vi). Now it's your turn. 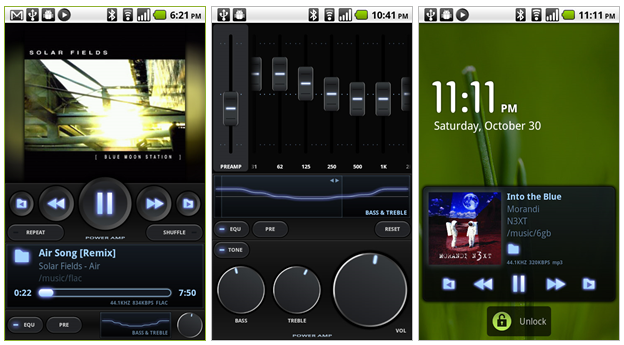 What is your favorite music player and why? Cast your vote and proceed to the comment zone. 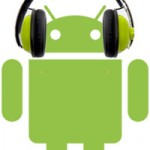 What is your favorite Android music player?